Complaint: Misdemeanor spelling of “storage”; Misdemeanor usage of third person singular present indicative (is) instead of third person plural present indicative (are); Misdemeanor splitting of “overnight” into two words. Defendant: Overpriced coat check at Jacob Javits Center. 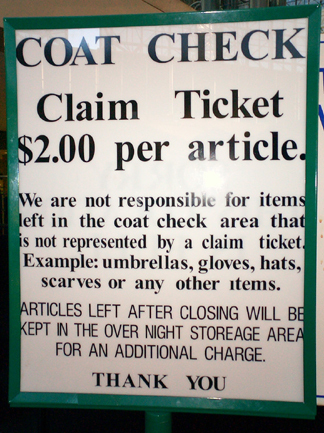 Report: Large, intrusive sign caught attention of officer as he paid too much to check his coat.